This is more than an app; it’s interactive art for the 21st century, featuring new & unique flowing paint effects, voice narration, & original music. (Selected extract) I would like to thank the judging committee in Tokyo for awarding me the prize. Aries the Sheep! started with a water color that I painted of the sheep covered with sea shells. 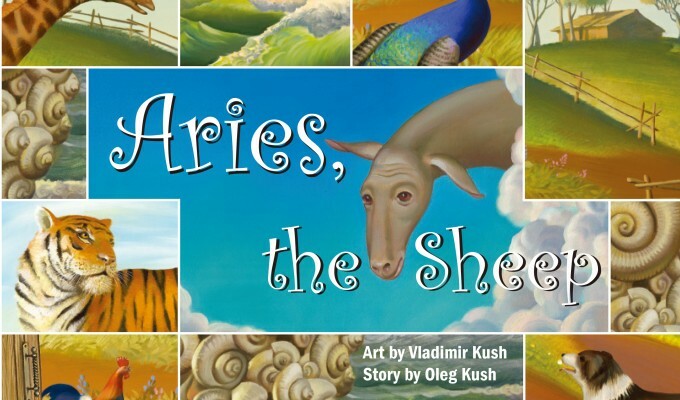 When we started discussing with my father Oleg, it triggered him to write this whole story about Aries… Creation of the app was impossible to do it by myself. There were different people involved. It was my graphic designer Maxim Kompaneets, it was a composer from the Russian conservatory Eugene Platonov, and the programmer Michael Burford. All of them, including myself and my father I consider it as a team that created that app, so I thank everybody to be a part of it. So thank you Tokyo for awarding me the prize. Thank you again, and I will continue with my path and create more apps, stories and children’s books. Thank you. Even though you are coloring the screen with your fingertips, you could actually feel the texture as if you are really touching the dirt, water and the feather with your fingertips. The content of the book may somewhat be for adults, but it will definitely leave a strong impression and a magical feeling to every child who play with this app.